I have over recent months come across materials which show that the Kipper© technique for message design which I have treasured and taught for many years (and now own as Intellectual Property) has become distorted by some over time. This is not altogether surprising, and I do not undervalue the efforts of those who have promulgated the power of the technique. But, I thought it best to attempt some restoration and return the Kipper© to its origin, purpose and full effectiveness; and avoid any further descent into the emergence of an incompetent fish with few powers of persuasion! I have been using the Kipper© technique for over 20 years. William Macnair was the original creator and I will always be in his debt for his brilliant construction of ideas. At the beginning of 2018 he legally assigned his Intellectual Property to me and my company and I remain committed to its full and faithful promulgation. However….. it’s a bit more complicated. Some of my blog postings on effective persuasion in communication have referred to the Kipper© framework and I assumed a reader’s understanding of it. But clearly, if readers have been mis-taught (or mis-remember) and therefore hold a different model in their minds, my builds upon it could create further confusion. So, I thought I should set matters straight and include here what the Kipper© model really is. The Kipper© is a tool primarily designed for (and based upon) deliberative rhetoric using the spoken word – persuasion to future action. Its focus is the creation of consistent and persistent memory. It has three parts: Tail, Middle and Head. That sequence of design (Tail first) is fundamental to the technique. In designing a message/presentation we should start with defining what our last few words (7 or less) are going to be – the Big Idea. It is this – usually (but not always) a “call to action” – which will drive the behaviour we seek. In the Tail is also the Summary – this immediately precedes the Big Idea – and is represented by the black dot at the base of the spine. The Summary is a word for word repetition of the Ideas in the Middle (note – without any labels or evidence). The next part to design is the Middle. There are two sides: Ideas on the left and Evidence on the right. The cognitive Rule of 3 applies – we can have up to 3 Ideas. We define the Ideas first that will lead to the Big Idea, and then work out what the most compelling evidence for each will be. You can see from the diagram that each bone of the Middle consists of a Label, Idea and Evidence (easy to remember as “LIE”). The label will however only be forthcoming when the Head is designed, and Structure labels defined. Each bone (necessarily both left and right), can be further decomposed to a lower level of 2 or 3 sub-bones, but you will need to do more work on structure and signposting. Now, the Head is a very important part of the Kipper©, designed to get the audience to a point when they can effectively listen to your message. The diagram shows the different components, their numbered sequence and very brief definitions of what they are. There is a lot of subtlety in the Head which will determine whether the presentation will achieve its objectives. It is, after all, all about the audience! I hope the above explanation is helpful in putting rigour back into the Kipper© technique. If you have come across a version which has a different anatomy, please substitute it with this correct version, and refer the purveyor tactfully to this blog. Please also remember that this Intellectual Property is owned by my company. If you have been trained in the Kipper© you can use the Kipper© . If you want to teach the Kipper© you need a licence. Applications are welcome. 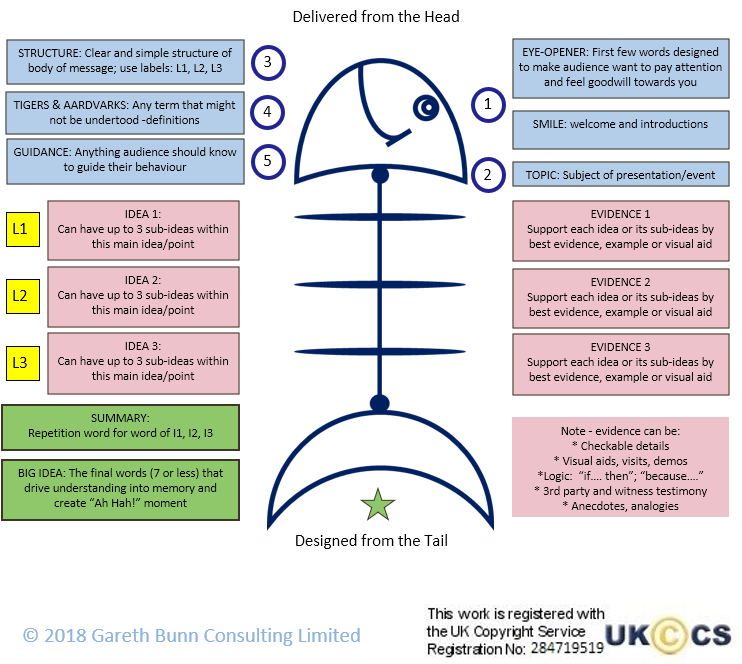 This entry was posted in Communication, presentation and tagged Big Idea, deliberative, evidence, kipper, memory, message, message design, persuasion, presentation, rhetoric by garethbunn. Bookmark the permalink. Thanks Garethbfor that reminder of how you actually apply the kipper framework. It can seem so simple, yet it’s power lies in really understanding the detail. Cicero would be proud of you for setting the record straight for everyone. Gereth, as you know, I am a huge fan of the Kipper methodology, and used this throughout my career.